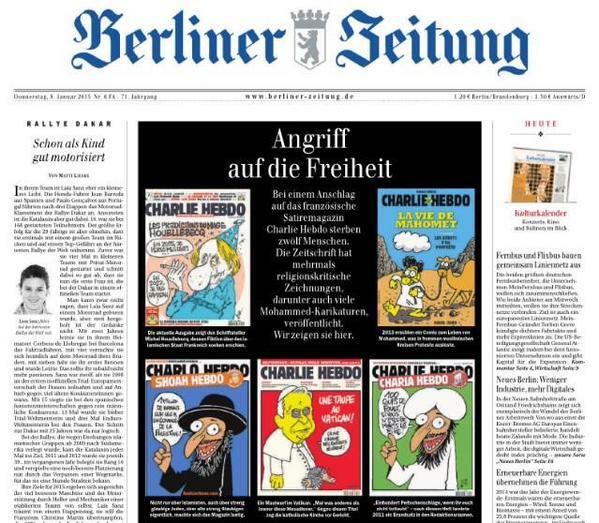 European newspapers reproduced the controversial cartoons in solidarity with Charlie Hebdo. 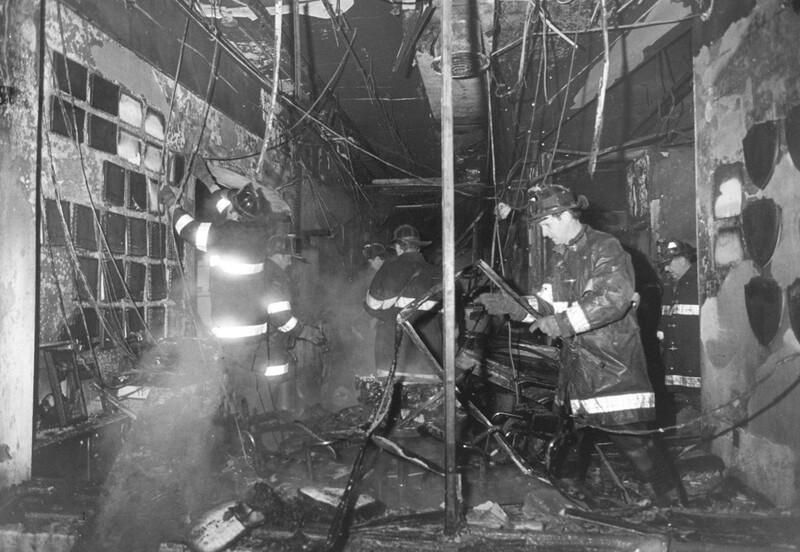 Twenty-five years ago, I watched flames consume the office of The Riverdale Press, the community newspaper my father had founded and I had edited for a decade. The issue on the newsstand that week included an editorial that defended our right to read Salman Rushdie’s novel The Satanic Verses. When I wrote it, I never imagined that it would make my newspaper an early victim of terrorism. The shattered Riverdale Press office: 1989. I thought that was motherhood and apple pie. We’ve all learned differently since then, most recently in the horrific assassinations at the magazine Charlie Hebdo in Paris. When The Press fought back–by bringing out its next issue on time a day after the bombing, by continuing its tradition of hard-hitting opinion writing, by publishing a defense of Rushdie on the anniversary of the bombing for the next 10 years—it had help. Residents, elected officials and community leaders, including many who had criticized the paper in the past, rallied behind it. But the most important source of aid came from the state’s other community newspapers. They reprinted the editorial that had provoked the bombing. Together with its publication by Sen. Daniel Patrick Moynihan in the Congressional Record and its reproduction in New York Newsday, they brought the message of a 13,000-circulation newspaper to a million readers, a stinging defeat for the terrorists who had sought to suppress it. In letters and conversations, many editors of those little weekly newspapers around the state told me that they were frightened about the consequences of publishing the editorial about The Satanic Verses. Some also said they disagreed with it; they believed that it was wrong to ridicule religion or thought that Rushdie should have known better that to bait devout Muslims. Nevertheless, they published the editorial because they wanted to stand in solidarity with The Press and with the principle that argument, not violence, was the way to express disagreement. Sadly, most American news outlets, including The New York Times, the Associated Press and the major broadcast and cable news networks, have flinched from publishing the controversial cartoons that incited the bloodbath in Paris. Worse, some have used technology to blur the images, as if they were obscene, or so horrific that readers and viewers needed to be shielded from them. In justification some have said that they found the cartoons disagreeable or crude or childish or needlessly provocative. Those judgments are condescending toward readers and viewers, who are deprived of the opportunity to judge for themselves. They also miss the point. The issue is no longer whether Charlie Hebdo’s demonstrated contempt for Islam (and religion generally) is justified. It is certainly not whether its means of expressing that contempt is effective. The murders call for us to defend the principle that in a free society no doctrine should be exempt from criticism and no criticism should be punished by violence. The refusal of leading American news outlets to reprint the Charlie Hebdo cartoons declares that in perilous times there are visions that must not be imagined and thoughts that must not be uttered. It is a victory for the forces of silence. In the six years that my students have reported for The Hunts Point Express, no one has been a victim of a crime, but the women reporters have been victimized by crude remarks, whistles and catcalls. Some have responded with anger; some with fear. Some have pushed forward aggressively; some have retreated in shame.